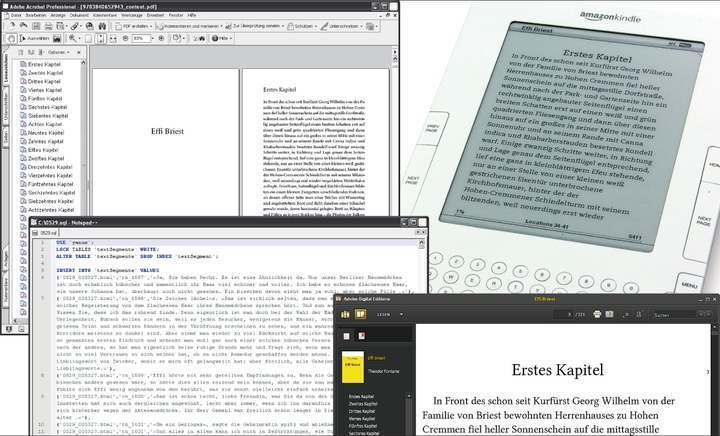 Founded in 2009, Yanus Verlag set itself the goal of reissuing the full spectrum of German-language literature in contemporary formats. The works are structured in OpenOffice and converted to XML data using an XSLT converter developed by le-tex. le-tex aspect then generates print and online PDFs from this as the target formats; plus EPUB, Mobipocket, and a full text index. The term “headless” comes from OpenOffice and means “operation without a graphic user interface”. This production system, however, does not use OpenOffice, but rather le-tex aspect in “headless” mode. The source data is stored on a server at Yanus with version control. When conversion of a work into the target formats is initiated via the Yanus content management system, communication with le-tex aspect takes place directly on a machine-to-machine basis, exclusively via the standard HTTP protocol. The generated target formats are in their turn automatically resubmitted for version control by le-tex aspect. Once quality control has been performed, these target formats are then placed on different e-commerce platforms – still in “headless” mode – using the corresponding web services. “Headless” certainly doesn't mean “brainless” in this case, therefore, but rather “automated for optimum efficiency”.